Clinics Collections: Lipid Disorders draws from Elsevier’s robust Clinics Review Articles database to provide multidisciplinary teams, including general practitioners, cardiologists, endocrinologists, pathologists, cardiologists, rheumatologists, and hepatologists, with practical clinical advice and insights on this highly prevalent condition and its comorbidities. 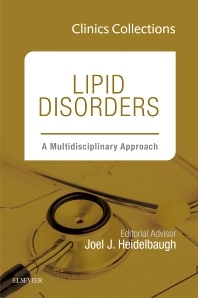 Clinics Collections: Lipid Disorders guides readers on how to apply current primary research findings on lipid disorders to everyday practice to help overcome challenges and complications, keep up with new and improved treatment methods, and improve patient outcomes. • Areas of focus include lipids and biomarkers, lipids and pharmacotherapy, lipids and heart disease, lipids and chronic disease, lipids and pediatrics, lipids and women’s health and special considerations. • Each article begins with keywords and key points for immediate access to the most critical information. • Articles are presented in an easy-to-digest and concisely worded format.